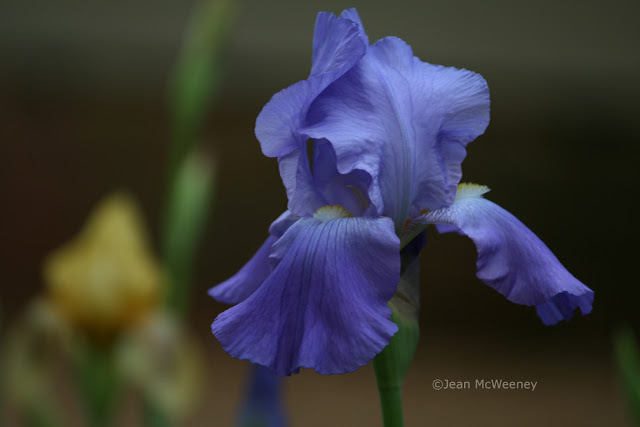 In honor of Garden Bloggers' Bloom Day, the first of the non-white bearded irises bloomed this morning. I don't know the variety of this, having bought it many moons ago at a plant sale where the rhizomes were just a jumble of various colors. Looks like one of the yellow ones will be in bloom by tomorrow. 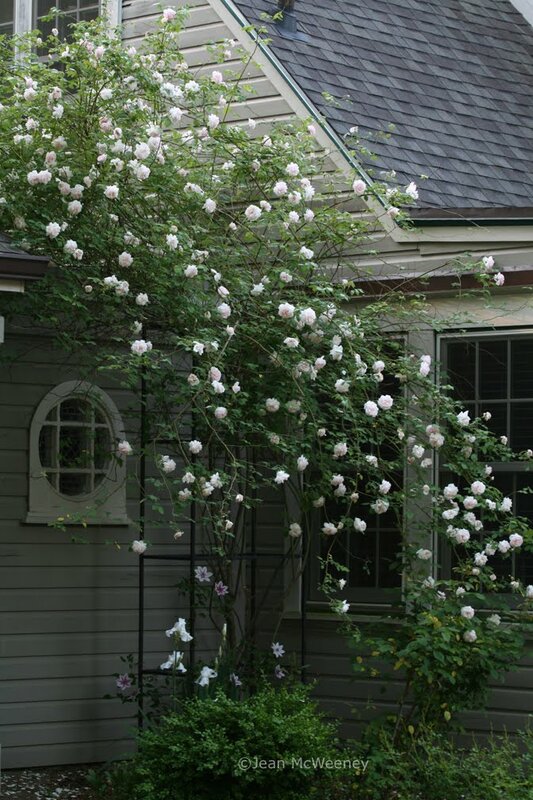 The first rose to bloom this year and in years past is the Madame Alfred Carriere climber. It's near to where we get out of our cars and the fragrance that hits us is sublime. I was supposed to trim it back last year after its spring bloom but as you can probably tell, I never got around to it. I really have to this year in order to give the 'Carnaby' clematis more sun. Soon baby, just hang on a little while longer. Continuing the white theme I have to show you my new favorite little shrub, Mrs. Schiller's Delight viburnum (Viburnum obovatum). I planted it last year and have been amazed by how long the flowers remain. 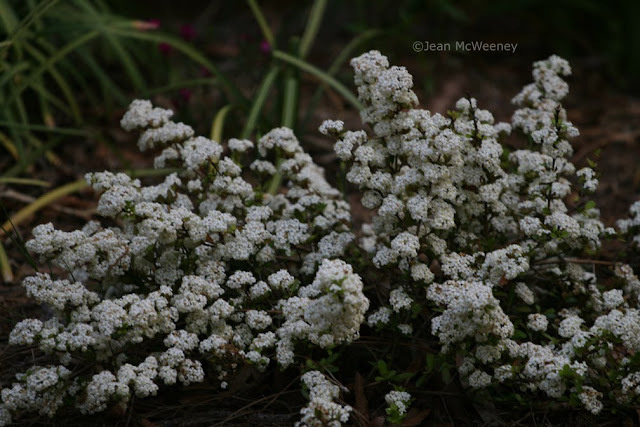 It's a dwarf shrub said to get about 3 feet. 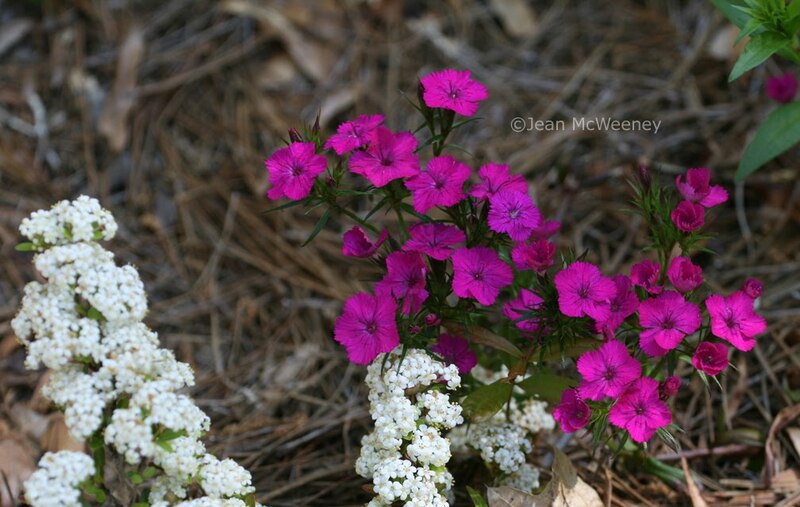 Next to one of the viburnums is Amazon Neon Duo dianthus. It was truly amazonian last fall, at least 10 inches tall, but now it's become a dwarf. Perhaps I needed to do something to get it heading north again but I'm not sure what. Almost forgot to give you a close up of the 'Carnaby' clematis. It's really put on some growth this year, as has my other clematis. I think the 3rd year is the charm for them (I also barely trimmed them in late winter). This is my other clematis, 'Fireworks'. I wish I had taken a good photo of it this morning because there are many more blooms and the newly planted Coral Honeysuckle (Lonicera sempervirens) is starting to bloom as well. You might be able to see their little buds on the left. The chives are going now. I really mustn't let them reseed this year as I'm tired of having to find homes for the little ones. This is what my "back alley" looks like (to be clear, the town stopped using alleys a long time ago and deeded half of the alley to each homeowner living alongside). In front of the compost pile are the weedy but lovely spiderworts as well as some other viney wildflowers. 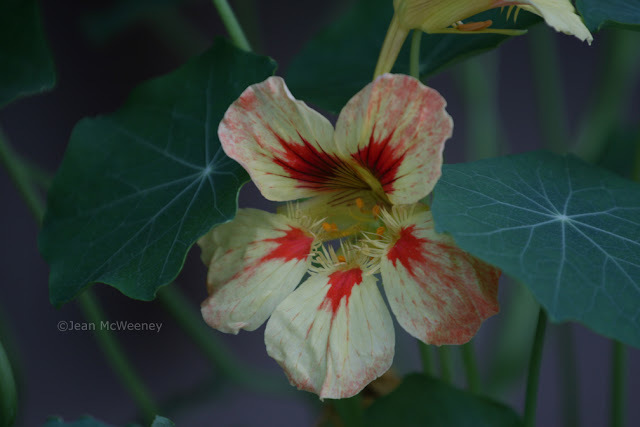 Isn't this a pretty little nasturtium bloom? I don't know the name of it as it was a freebie to me. 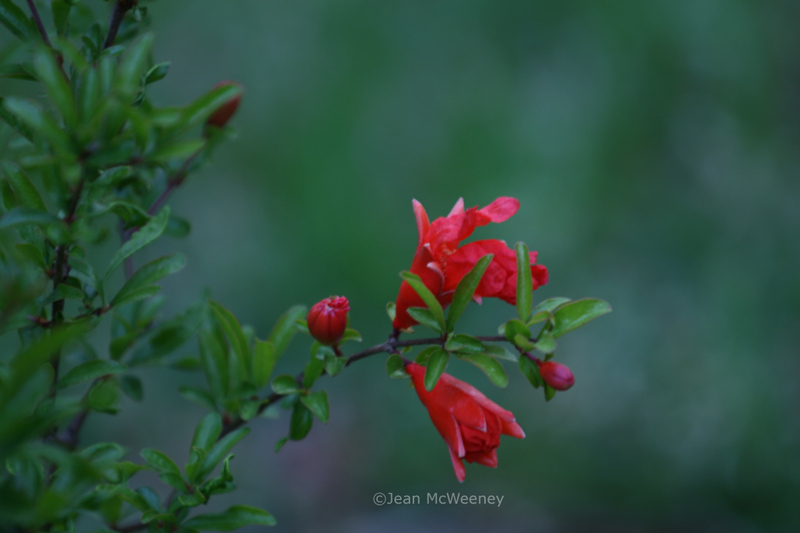 I leave you with this dwarf pomegranate just starting to put on some blooms (btw, I have this in a pot). Be sure to visit Carol's blog to see what's happening in her garden and the gardens of bloggers all over the world! I absolutely love "Mde. Alfred Carierre". I lost my first one to rose rosette disease and had to get another one. It should start blooming soon. That nasturtium bloom is stunning. Nasturtium! Amazing! I've been thinking about a pomegranate. I have space now with the damage the winter did here. Chives!!! Yummy! Your photos simply took my breath away! I'm growing the same Clematis but the poor gal is still buried in snow up here in the mountains. Happy Bloom Day! As soon as I saw those iris and clematis blooms at this time of the month, I knew you were not from around here. Very nice. 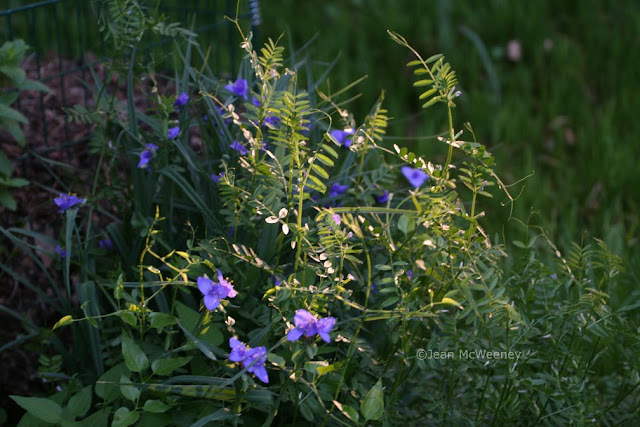 Lovely blog and beautiful photographs - happy Bloom Day too!! Just beautiful! I'm particularly envious of the bearded iris, but anyway, I'm just grateful to have discovered Dutch iris. Love those chives but hate those babies! The rose is amazing; climbing roses are almost impossible to grow up here, so it's really fun to see one like yours. Totally enjoyed the Pomegranate shrub! 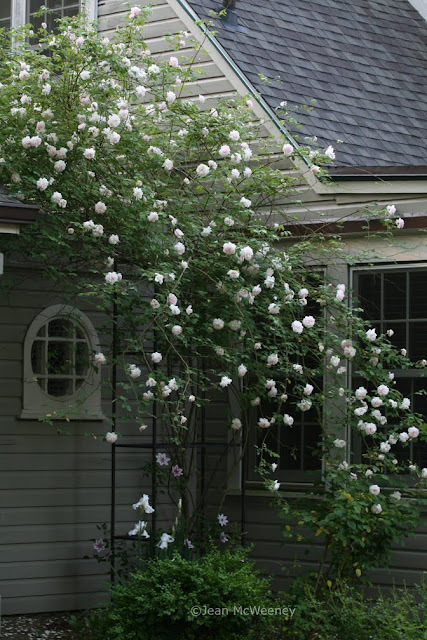 That climbing rose is stunning! And I love the wild spiderwort - it's one of my favs. Happy GBBD! I LOVE bloom day! What a treat to tour your garden. The first roses blooming here were Lady Banks. A yellow determinate bloomer but unstoppable. Given time, Lady Banks can cover a cottage right up to the chimney. And the pomegranate, how much fun! Do you get fruit? Kathleen - I have gotten fruit off the dwarf pomegranate but they're very small. I grow it mostly for the flowers and I like the look of the fruits on it. But I wouldn't bother to try and eat them because of the size. Gorgeous flowers as always! I remember the rose from last year, and was hoping to see it again soon. Thanks for giving us the glimpses of your lovely garden. That blue iris is sublime and the rose is cascading poetry. Love them. The nasturtium is adorable! Maybe I can find some seeds for it. 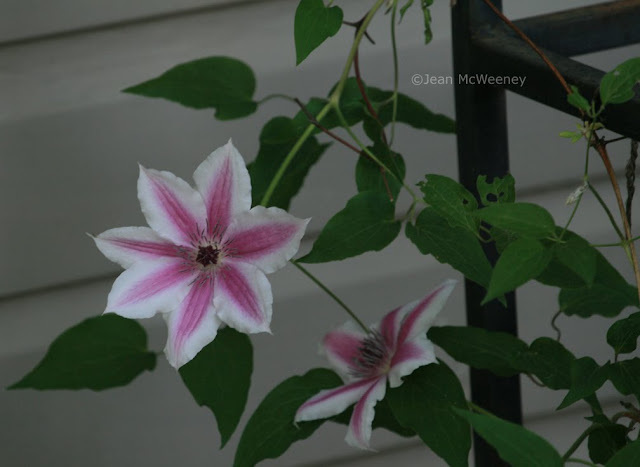 Anameless clematis is blooming but Fireworks and Carnby have buds, so they will soon bloom too. Beautiful blooms. I love the rose. It looks so much more manageable than Lady Banks. The nasturtium is one I have never seen and as for your clematis, I am making a note of the names.- What a delight. I really was going to replace mine this year and then I never saw any. A must next year. I love the nasturtium....I have never seen that particular one before. You have many beautiful flowers in your gardens at the moment. It must be just so lovely to get out of the car and be greeted with the perfume from the climbing Rose. 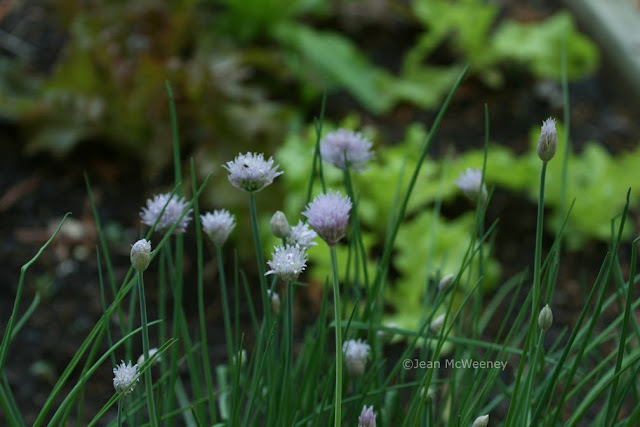 I love chives......I wish that mine would seed about. They never seem to for some reason. Beautiful blooms and what a great freebee! My chives are spreading like crazy, but not blooming at the moment. 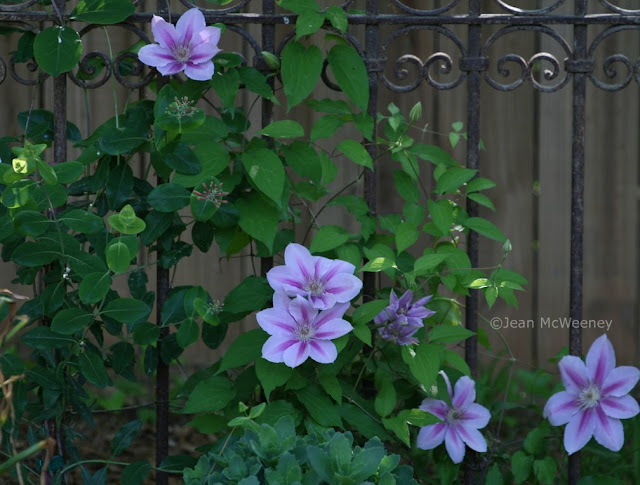 I love your Clematis! I took your suggestion and brought my mystery rose to the Antique Rose Emporium - didn't get an answer, but at least a side-by-side comparison with Zepherine Drouhin ruled that one out. Your garden is ahead of mine - dwarf pomegranate tight buds and no chive flowers yet! Annie, I'm kind of surprised that the ARE couldn't ID your rose. You definitely have a mystery there. Have you thought about maybe Climbing American Beauty? I also used to have that one and the color was very similar (and it had thorns and was fragrant). It's also surprising that I'm ahead of you when it comes to a few more things blooming - strange season!